Get a head start on making this 'Cinnamon Bun' Casserole with cinnamon-raisin bread. 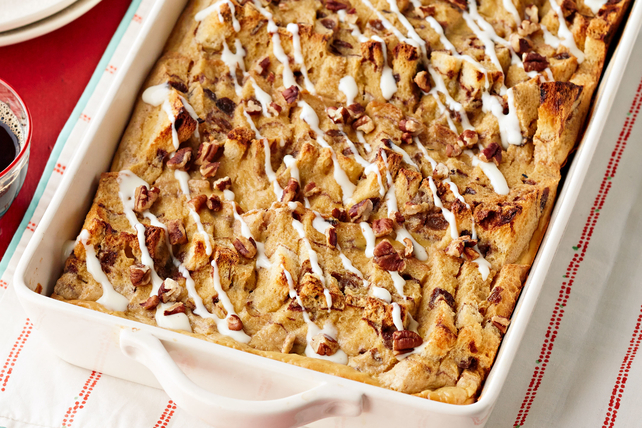 'Cinnamon Bun' Casserole is perfect for weekend entertaining. Cut each bread slice diagonally in half twice to make 4 small triangles. Stand, with points up, in 4 lengthwise rows in 13x9-inch baking dish sprayed with cooking spray. Mix 6 oz. cream cheese and brown sugar in large bowl until blended. Stir in cinnamon and vanilla. Add eggs, 1 at a time, mixing well after each addition. Reserve 1 Tbsp. milk. Gradually whisk remaining milk into cream cheese mixture; pour over bread. Refrigerate 8 hours. Heat oven to 350ºF. Bake casserole, uncovered, 40 to 50 min. or until knife inserted in center comes out clean and top is golden brown. Mix remaining cream cheese, powdered sugar and reserved milk until blended. Drizzle over casserole; sprinkle with nuts. Prepare using your favorite sweet bread and substituting chopped BAKER'S Semi-Sweet Chocolate for the nuts. Serve this sweet casserole with fresh blueberries.